PRI’s Programme Development Director reports on a consultation this week with experts in Bali, Indonesia. 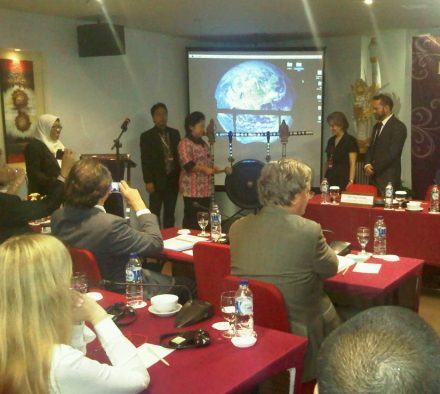 Organised jointly by the Norwegian and Indonesian Governments, the office of the UN Special Representative on Violence against Children and UNICEF, the consultation began with an outline of the new Indonesian Juvenile Justice (JJ) Law adopted in 2012 and due for enactment from 2014. The sessions which followed outlined both theoretical and practical approaches to understanding and implementing restorative-justice based approaches to juvenile justice. At its simplest level restorative justice can be seen as a way of helping restore the damage of offending behaviour through a process that holds the perpetrator accountable while at the same time helping address the needs of victims, families and communities. The opening sessions included presentations from the University of Ulster reflecting on some lessons learnt from Northern Ireland, from the Norwegian Ombudsperson for children, from the Council of Europe and from the former chair of the Committee on the Rights of the Child. Practical country experiences were shared by participants from a wide range of countries including the Philippines, Peru, Australia, South Africa, Norway, Thailand and Brazil. The second day included a focus on oversight mechanisms including monitoring and evaluation through the work done by bodies such as Indonesia Child Protection Commission and the Norwegian and Peruvian Ombudspersons as well as indicators developed and used by the International Juvenile Justice Observatory (IJJO). PRI’s presentation on child sensitive complaints mechanisms (for children deprived of their liberty) was well received and there was a lot of interest expressed in receiving copies of PRI’s forthcoming briefing on the subject (to be published in September 2013). The final sessions of the conference focused on topics including mediation and diversion in the justice system, implementing community-based restorative justice processes and programs and implementing restorative justice for children in informal (customary) justice systems. While chairing the discussion on informal and customary justice systems, PRI shared with participants the experience of work done in Bangladesh developing the Madaripur Model of Mediation as well as in documenting the system of Gacaca in Rwanda. Key conclusions from the conference included reiterating the importance of restorative-based approaches, and agreeing more work was needed with regards to both strengthening legislation as well as strengthening systems for delivery through proper allocation of resources, capacity building, and increasing public awareness of the benefits of such an approach in dealing with children in conflict and contact with the law.